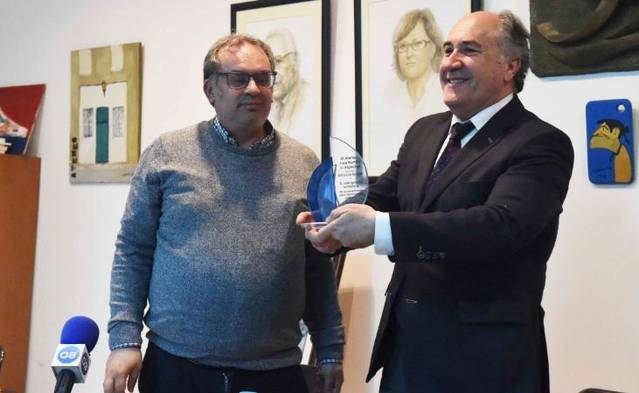 In the afternoon, the headquarters of the Ateneo José Román has given space to the event where the 25th anniversary of this cultural collective of the city of Algeciras has been celebrated, where the mayor, José Ignacio Landaluce, has been named honorary member of this entity. During the event, the mayor who was accompanied by the president of the Ateneo and delegated in Cádiz, Huelva and Seville of the National Union of Writers of Spain, Juan Emilio Ríos, and the deputy mayor, Eva Pajares, has put in work the great work carried out by the Ateneo José Román since its inception 25 years ago in order to promote the culture and art of the city. Likewise, its president has taken stock of these 25 years of history and life of this cultural group in the city, remembering the different prizes that have been awarded with respect to the Athenaeum Culture Prize, and the Rafa Viso Prize, which during this event has read the winners of this year 2019. In this sense, the board of directors of the athenaeum has appointed Carlos Gómez de Avellaneda, with the Ateneo de Cultura 2019 prize, for his career at the Institute of Campo Gibraltareños Studies and the La Trocha association, while the prize for young talents "Rafa Viso "has been awarded to the young San Roque historian Rubén Pérez. He also recalled that the José Luis Tobalina prize went to Emi Luna. Also taking advantage of the mention to the honorary members of this athenaeum, its president has delivered to the mayor of the city, the plaque of appointment as honorary members of the Athenaeum José Román, as well as to the deputy mayor of Culture, Pilar Pintor , which has been collected by Deputy Mayor Eva Pajares. Juan Emilio Ríos has stressed that this appointment of municipal authorities as honorary partners comes thanks to the fluidity, commitment, and coordination maintained by the mayor and his government team with this group, something never seen in previous mandates. For its part Landaluce, who congratulated all the winners, has had words of gratitude for this recognition, since the Ateneo is a major player in the culture of Algeciras, a committed group, whose coordinated work with the City Council makes our culture follow growing. Finally, Landaluce congratulated all the members of the Ateneo José Román for the celebration of this silver wedding, and for all that work they do to promote culture and art, which will be reflected during the development of the Fair of the Book which is dedicated to this cultural entity. The act has had the musical participation of Julia Jimenez and Manolo Báez, as well as the presentation of a plastic exhibition of a series of works donated by different artists, whose profit from their sales will go to the association of multiple sclerosis. During the ceremony were present the deputy mayor Jacinto Muñoz, Luis Ángel Fernández, Juana Cid, Diego González, Francisco Javier Rodríguez Ros, as well as the ediles Diego de Salas, Segundo Ávila and Laura Ruiz. In addition to different members of the cultural and artistic field of the city and the president of the Multiple Sclerosis Association, Javier Cózar.